This is the accompanying website for the paper "A Review of Automatic Drum Transcription" by Chih-Wei Wu, Christian Dittmar, Carl Southall, Richard Vogl, Gerhard Widmer, Jason Hockman, Meinard Müller, and Alexander Lerch. In Western popular music, drums and percussion are an important means to emphasize and shape the rhythm, often defining the musical style. If computers were able to analyze the drum part in recorded music, it would enable a variety of rhythm-related music processing tasks. Especially the detection and classification of drum sound events by computational methods is considered to be an important and challenging research problem in the broader field of Music Information Retrieval (MIR). Over the last two decades, several authors have attempted to tackle this problem under the umbrella term Automatic Drum Transcription (ADT) [1,2,3]. This paper presents a comprehensive overview of ADT research, including a thorough discussion of the task-specific challenges, categorization of existing techiniques, and evaluation of several state-of-the-art systems. To provide more insights on the practice of ADT systems, we focus on two families of ADT techniques, namely methods based on Non-negative Matrix Factorization (NMF) [4,5,6,7] and Recurrent Neural Networks (RNNs) [8,9,10]. We explain the methods’ technical details and drum-specific variations and evaluate these approaches on publicly available datasets with a consistent experimental setup. Finally, the open issues and under-explored areas in ADT research are identified and discussed, providing future directions in this field. (a) Example drum recording in a log-frequency spectrogram representation. Darker shades of gray encode higher energy. 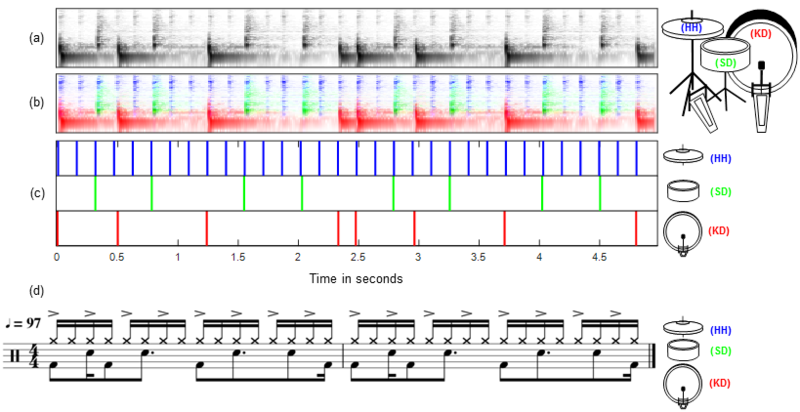 (b) The same spectrogram representation with color-coded contributions of individual drum instruments. (c) Target onsets displayed as discrete activation impulses. (d) Drum notation of the example signal. The note symbols have been roughly aligned to the time axis of the figures above. The following tables provide links to the complete evaluation results of our comparison of state-of-the-art methods in CSV-format. Alternatively, you can download an Excel-file with all tables included here: [Complete Results]. The abbreviations used below are F (F-Measure), P (Precision), R (Recall). These links lead to source code of the algorithms compared in our experimental evaluation. These links lead to the publicly available corpora we used for our experimental evaluation. PhD Thesis, Dublin Institute of Technology, 2004. In Klapuri, Anssi and Davy, Manuel (ed. ): Signal Processing Methods for Music Transcription, Springer: 131–162, 2006. PhD Thesis, Tampere University of Technology, 2009. In Proceedings of the International Conference on Digital Audio Effects (DAFx), 2012. In Proceedings of the International Conference on Digital Audio Effects (DAFx): 187–194, 2014. In Proceedings of the European Signal Processing Conference (EUSIPCO), 2015. In Proceedings of the International Society for Music Information Retrieval Conference (ISMIR): 257–263, 2015. In Proceedings of the International Society for Music Information Retrieval Conference (ISMIR): 730–736, 2016. In Proceedings of the International Society for Music Information Retrieval Conference (ISMIR): 591–597, 2016. In Proceedings of the IEEE International Conference on Acoustics, Speech, and Signal Processing (ICASSP): 201–205, 2017.